This album is kind of the purpose of this project; to listen to records I haven’t listened to in a long time. Jimi Hendrix was an artist I listened to in high school. I think it was expected that every 15 year old would love Jimi Hendrix. I don’t really know why. 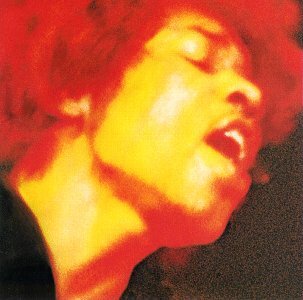 I would categorize Hendrix’s music as “guitar wankery.” Seriously, “Voodoo Chile” is 15 minutes long. Exactly. It’s tedious and boring. It almost feels that this record is blues-light. A means for teenagers to have a stepping stone into the blues, but Hendrix wasn’t my stepping stone. Instead, I found myself following The Byrds to country music and the blues never intrigued me too much. This album feels like an ego massage. There’s a LOT of filler, and it doesn’t need to be a double album. Hendrix could have easily parsed this record down to a single disc. There’s no need for a 15 minute track, or the 13 minute 39 second “1983…(A Merman I Should Turn To Be).” If I were in charge, I could easily put this down to about 10 tracks… let’s see? That’s not to discount Hendrix or Electric Ladyland wholly and completely. “All Along The Watchtower” is perhaps the best Bob Dylan cover of all time and the Noel Redding-penned pop song “Little Miss Strange” are amongst the best parts of this album. What the hell is “1983…(A Merman I Should Turn To Be)?” The amount of illicit drugs used to make this song is just plainly fucked up. I’m going to get hate mail.